NETIZEN CLAIMS THAT HUGE SLAB OF CONCRETE CAME OFF THE TRAILER TRUCK @ PUNGGOL! 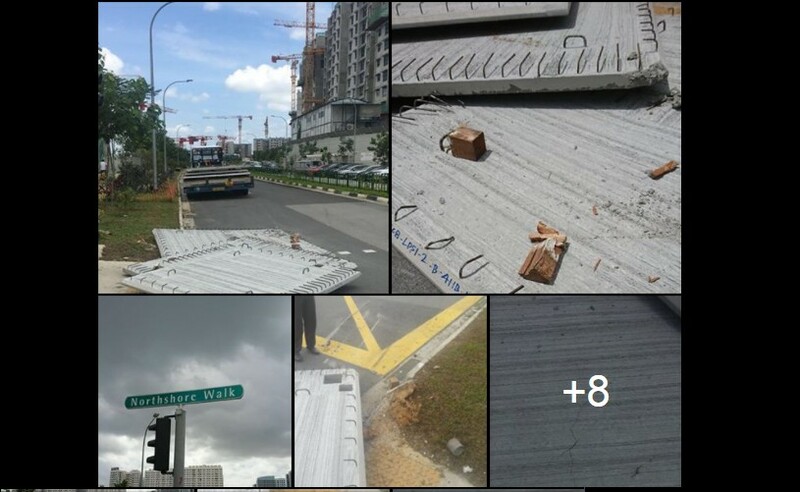 You are at:Home»Featured»NETIZEN CLAIMS THAT HUGE SLAB OF CONCRETE CAME OFF THE TRAILER TRUCK @ PUNGGOL! So dangerous this happen at Punggol BHCC imagine if this drop on any passerby or any car this is an instance kill. Previous ArticleTAXI DRIVER DON”T BE SURPRISE TO HAVE PRICE HIKE BE UPON US SOONER THAN EXPECTED! Next Article BUS SERVICE OPERATOR AT GOLDEN MILE CEASED BUSINESS WITH IMMEDIATE EFFECT!